"A very Victorian recipe! 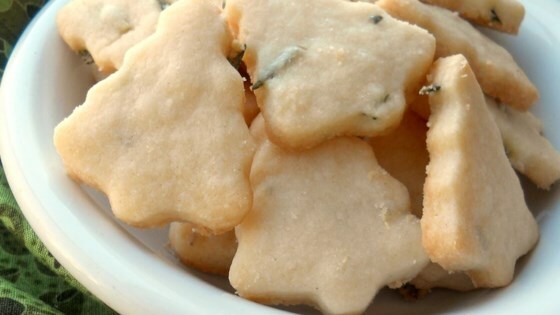 Some people are put off by the notion of herb cookies, but you'll be pleasantly surprised. The flavor improves with age (best 2 days after), keeping for about a week." On a lightly floured surface, roll the dough out to 1/4 inch thickness. Cut into rectangles 1 1/2x2 inches in size. Place cookies 1 inch apart on the lined cookie sheets. Sprinkle the remaining sugar over the tops. Is something missing? I ended up with NOT a creamy mixture. Too much flour, or not enough of something else. Too powdery to roll out. I had to cook mine longer than 8 mins to get them done, and managed to over cook them slightly. Nevertheless they tasted great! I will be making these again and experimenting with the timing.